For the Birmingham, Alabama airport, see Birmingham–Shuttlesworth International Airport. Birmingham Airport (IATA: BHX, ICAO: EGBB), formerly Birmingham International Airport is an international airport located 5.5 nautical miles (10.2 km; 6.3 mi) east southeast of Birmingham city centre, at Bickenhill in Solihull, England. It has a CAA Public Use Aerodrome Licence (Number P451) that allows flights for the public transport of passengers or for flying instruction. Passenger throughput in 2015 was over 10.1 million, making Birmingham the seventh busiest UK airport. 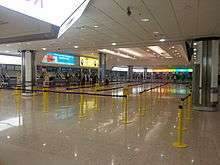 The airport offers both domestic flights within the UK, and international flights to destinations in Europe, the Middle East, the Indian subcontinent, North America and the Caribbean. Birmingham Airport is an operating base for Flybe, Monarch, Ryanair, Thomas Cook Airlines, and Thomson Airways. From March 2017 the airport will be a base for Jet2.com. 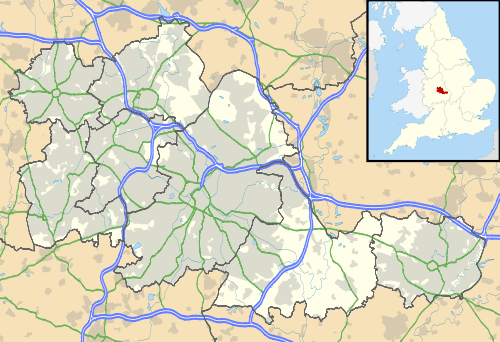 Birmingham Airport is 5.5 NM (10.2 km; 6.3 mi) east-south-east of Birmingham city centre, in the Metropolitan Borough of Solihull. It is bordered by the National Exhibition Centre to the east, Marston Green to the north, Sheldon to the west, and the village of Bickenhill to the south. During World War II the airport was requisitioned by the Air Ministry and was used by the RAF and the Royal Navy as RAF Elmdon, an Elementary Flying School and a base for the Fleet Air Arm. During this time, the original grass strip was replaced by two hard runways: 06/24 at 2,469 feet (753 m) and 15/33 at 4,170 feet (1,271 m). Avro Lancaster and Stirling bombers manufactured at the Austin Aero Company's shadow factory at Cofton Hackett could not take off from the short runways at Longbridge. Instead they were transported by road, minus the wings that would be attached at Elmdon. They were test flown from the aerodrome, and once declared airworthy they were flown to their operational units. The aerodrome returned to civilian use, though still under government control, on 8 July 1946. During the post-war years, public events, such as air fairs and air races were held on the site. In 1961 an additional terminal building to handle international traffic was opened, called The International Building. In 1967 the main runway was extended to 7,400 feet (1.4 miles) to allow jet operations, including introducing VC-10 services to New York. In 1993, the Government limited public sector borrowing. This meant that the airport could only expand by using private sector finance. 51% of the local council shares were sold to restructure the airport into a private sector company, enabling a £260 million restructuring programme to begin in 1997. The control tower and main runway, with aircraft standing at the main terminal building in the foreground. On 20 October 2003, the Concorde made her final visit to Birmingham Airport on as part of her farewell tour. In June 2006, a new turnoff from the main runway was completed and saw an improvement in traffic rates on southerly operations, where the only available option for landing traffic had been to travel to the end of the runway to exit. In November 2007, the airport published a master plan for its development up to 2030, called "Towards 2030: Planning a Sustainable Future for Air Transport in the Midlands". This sets out details of changes to the terminals, airfield layout and off-site infrastructure. As with all large scale plans, the proposals are controversial, with opposition from environmentalists and local residents. In particular the requirement for a second parallel runway based on projected demand was disputed by opponents. Plans for a 2nd runway on the other side of the M42 and a new terminal building and business park have been published, and they could help to create around 250,000 jobs. It has been estimated that if these plans went ahead, the airport could handle around 70,000,000 passengers annually, and around 500,000 aircraft movements. In January 2008, the shorter runway (06/24) was decommissioned. It had been used less often due to its short length, noise impact, and its inconvenient position crossing the main runway making it uneconomic to continue operation. The closure also allowed for apron expansion on both sides of the main runway. However it remains open as a taxiway and a helicopter airstrip. In the same month, plans for the extension of the airport runway and the construction of the new air traffic control tower were submitted to Solihull Metropolitan Borough Council. In June 2008, work began on building the new three-storey International Pier. It was officially opened on 9 September 2009. As part of the airport's 70th anniversary, the airport welcomed the Airbus A380 as the first user of the pier. The special service was the first commercial A380 flight in the UK to take place outside London Heathrow Airport. The new pier is a three-storey construction, 240 metres long and 24 metres wide. Departing passengers will be accommodated on the top level, with arriving passengers on the middle level and office accommodation for airline and handling agents on the ground floor. The new facility provides air-bridged aircraft parking for seven wide-bodied aircraft and enough space to serve 13 smaller aircraft at any given time and is capable of accommodating 'next generation' environmentally-efficient wide-bodied aircraft such as the Airbus A380, the Boeing 777 and the Boeing 787 Dreamliner which all serve the airport on a daily basis. The new pier also hosts a new lounge for business class Emirates passengers. The runway extension plans were approved in March 2009. An announcement was made in September 2010 that following the merging of Terminals 1 & 2 in 2011, the airport would drop the International from its official name to become Birmingham Airport. At the same time British Airways withdrew their flights and the Eurohub, which is now ground level check in, was transferred to Manchester Airport. A Midlands-based marketing agency was recruited to "create a new corporate identity that reflects Birmingham Airport's current position in the market place, as well as its future potential". Figures from Birmingham Airport show that 8 million people live within a one hour's drive of the airport, but less than 40% of them use it. It is hoped that the rebrand will make the airport "more visible to the market". In November 2010, the new name started to be used. The new logo, interlocking circles in shades of blue, and slogan, "Hello World", were designed to reflect the airport's new positioning as a global travel hub. The spectators gallery, 'Aviation Experience', above Terminal 1 closed indefinitely in January 2011 In the same month, the airport merged its two terminals into a single Terminal Building. This involved building two new floors added to the airport's terminals. A new Lower Ground Floor accommodates the new Arrivals and Meet & Greet area. The 3rd floor was built in the Millennium Link and the two terminals to accommodate the new Centralised Security Search area. On 23 February 2011, it was reported that Birmingham Airport had announced the High Speed 2 extension could be a solution to runway capacity problems in London, citing that will be quicker to get to London from Birmingham than from London Stansted once completed and claimed that the airport had capacity for nine million more passengers. Construction of a new control tower for the airport began in July 2011, to replace the old tower which has stood at the airport since it was opened in 1939.The construction of the new air traffic control tower was completed in March 2012. In Summer 2012, the new air traffic control tower's equipment was installed and testing and training began. An Olympic ceremony was held at the airport on 23 April 2012. The Olympic rings were unveiled on the tower and could be seen from the A45 road and the main terminal building. This was to commemorate the build-up to the London 2012 Olympic games. These rings were removed once the Olympic Games officially closed, just before 2012 Summer Paralympics began. In autumn 2012, construction of the runway extension began, whose original target was in time for the 2012 London Olympics and Paralympics). The extension to the southern end of the runway originally required the A45 Coventry Road to be diverted into a tunnel under the extended section, but to cut immediate costs, it was diverted south of the runway instead. In summer 2013, the new air traffic control tower became fully operational and also the old carriageway of the A45 road was closed and the new carriageway was opened. In May 2014, the 400-metre runway extension was officially opened. The Ontario Teachers' Pension Plan increased its stake in the airport to 48.25% in early 2015. The Canadian institutional investor firm also has ownership in Bristol Airport (100%). Birmingham handled over 10.1 million passengers in 2015, a record total for the airport making it the seventh busiest UK airport. On 27 March 2016, Emirates began daily Airbus A380 flights from Dubai to Birmingham taking the total daily flights to three including two flights operated by Boeing 777-300ER. On 28 September 2016, £100 million of investment was given to the airport. The airport plans to put into place a new baggage handling systems, two new car parks including a drop-off car park. Birmingham Airport currently features a single two-storey passenger terminal building. The ground level features 112 check-in counters (numbered 1-82 and 100-130) in two separate areas labelled as Terminal 1 and Terminal 2 as well as the arrivals facilities and several shops, restaurants and service counters. The larger first floor consists of the security areas, check-points and a large airside area equipped with more shops, restaurants and bars that are connected to 48 departure gates in the two separate terminals - gates 1-20 in Terminal 2 and 40-54 and 55-68 in Terminal 1. Terminal 2 features 9 stands equipped with jet-bridges as well as three walk-boarding stands while Terminal 1 features 11 stands with jet-bridges of which some are able to handle wide-body aircraft. Plans for the extension of the airport's current runway, and the construction of the new air traffic control tower, were submitted to Solihull Metropolitan Borough Council in January 2008, and approved in March 2009. The construction of the runway extension, and the new air traffic control tower, began in March 2011. The extension to the southern end of the runway originally required the A45 Coventry Road to be diverted into a tunnel under the extended section, but to cut costs, it was diverted to the south of the runway. However, plans to build a tunnel under the runways extension are to be met by 2030 when expansion to the south of the current airfield go ahead. In August 2013, the old carriageway of the A45 road was closed, and the new carriageway was opened. Originally, the target for completion was in time for the 2012 London Olympics and Paralympics. However, work began in late 2012, and the runway was completed in early May 2014. The runway extension began to be used by aircraft in May 2014, and was officially opened on 22 July 2014, when China Southern Airlines operated its first charter flight between Birmingham and Beijing. This was the first aircraft that needed to make use of the new runway length. The extension caused controversy as more than 2,000 local residents complained about the increased noise levels due to the new flight path around the airport that was required after the runway was extended. 19 November 2010 (2010-11-19): A Cessna Citation aircraft, registration G-VUEM, crashed at Birmingham Airport during final approach in thick fog. Reports from West Midlands Police were that there were two casualties, one critical. The aircraft was bringing a human liver from Belfast airport, for a transplant operation which was subsequently completed successfully. The airport reopened at around mid-day the following day. 8 June 2009 (2009-06-08): The West Midlands Police helicopter (G-WMAO) was destroyed by arsonists, and subsequently written off. A year later, a new Eurocopter EC135 similar to G-WMAO was handed over to West Midlands Police at the Farnborough Airshow. Thousands of pounds have now been spent upgrading security surrounding the new police helicopter. 17 July 2014 (2014-07-17): A member of the public got onto the airfield through a restricted area of the terminal by crawling through the opening of a baggage carousel and getting onto the airport's tarmac apron, and then got aboard a Lufthansa Embraer 195 plane. Birmingham Airport is served by Birmingham International station. The station is on the West Coast Main Line between Birmingham and London, and trains are operated by London Midland, Virgin Trains, Arriva Trains Wales and CrossCountry. Access between the railway station and the airport terminal is provided by the free AirRail Link. As part of the proposed High Speed Two rail link, a new railway station called Birmingham Interchange would be built to serve both the airport and the National Exhibition Centre. The station would be built on the far side of the M42 motorway and connect to the airport using a "rapid transit people mover". If the project is given the go ahead, High Speed Two is currently planned for completion by 2026. National Express West Midlands operates the main bus routes calling at Birmingham Airport, those being the number 900 to Birmingham city centre and Coventry, and the 966 to Erdington and Solihull. Additionally service 97A to Birmingham via Chelmsley Wood now runs to the airport 24hrs a day. Other smaller operators also call at the airport. Bus stops are situated outside Terminal One. Most buses are operated by National Express West Midlands, who do not give change when selling tickets, so foreign travellers will need to ensure they have British coins when taking a local bus. However adult daysavers can be purchased with euros for 5 euros. 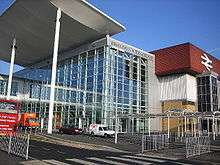 Birmingham Airport is accessible from the north and south via Junction Six of the M42 motorway. From Birmingham city centre, the A45 runs directly to the airport. There is a drop-off area available outside the terminal; charges apply when parking for more than ten minutes. ↑ "Birmingham Airport". Airport Watch. Retrieved 20 November 2013. ↑ "Birmingham: A hassle free alternative for long-haul travel". Flybe.com. Retrieved 2016-10-02. ↑ "NATS - AIS - Home". Retrieved 4 June 2015. 1 2 3 4 5 6 "Aircraft and passenger traffic data from UK airports". UK Civil Aviation Authority. 25 March 2016. Retrieved 3 April 2016. ↑ "We're Saying 'Hello World' As We Relaunch Our Brand". Birmingham Airport. ↑ "The History of Birmingham International Airport". Birmingham International Airport. Retrieved 29 April 2008. ↑ "The History of Birmingham International Airport". Birmingham International Airport. Retrieved 15 January 2015. ↑ "Birmingham Airport Master Plan". Birmingham Airport. ↑ "Birmingham Airport reveals vision of new runway". Birmingham Post. Retrieved 21 April 2016. ↑ "Airport closes its oldest runway". BBC. 28 December 2007. Archived from the original on 4 April 2014. ↑ "Emirates opens £1,3 million lounge for passengers at Birmingham". Birmingham Mail. ↑ "Birmingham Airport changes name". Birmingham Mail. ↑ "New Agency to Manage Rebrand Announced". birminghamairport.com. ↑ "Birmingham Airport (home page)". Retrieved 4 November 2010. ↑ "Plane spotting at Birmingham Airport". TMC Ltd.
↑ "HS2 'will bring Birmingham Airport closer to London'". BBC News. 23 February 2011. 1 2 "New Air Traffic Control Facility". Birmingham Airport. 1 2 Smith, Graham. "Birmingham Airport runway extension ready next week". ↑ "Runway extension at Birmingham International Airport could be completed by 2012 Olympic Games". Retrieved 21 April 2016. ↑ Cartledge, James. "Birmingham Airport runway scheme back on track". 1 2 "Birmingham Airport runway extension work starts". BBC News Online. 28 November 2012. Retrieved 18 December 2012. 1 2 "Preferred Contractor Announced for Runway Extension Scheme". 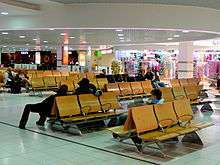 ↑ "Pension fund raises stake in UK's Birmingham Airport". January 2, 2015. ↑ "Emirates to introduce first regular scheduled Airbus A380 service into Birmingham Airport from March 2016". Birmingham Airport. 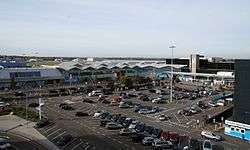 ↑ "Birmingham Airport reveals plan for £100m investment". BBC News. 1 2 Graham Smith. "Birmingham Airport runway extension ready next week - Business Traveller". Retrieved 4 June 2015. ↑ "American Airlines to stop Birmingham Airport flights". Bbc.co.uk. Retrieved 2016-10-02. ↑ "Schedule| Blue Air". Blueairweb.com. Retrieved 2016-10-02. 1 2 3 4 5 6 7 8 9 10 11 12 13 14 15 "Jet2.com Adds Birmingham Routes in S17". routesonline. Retrieved 7 July 2016. ↑ Liu, Jim (31 August 2016). "Monarch adds new seasonal routes in W16". Airline Route. Retrieved 31 August 2016. ↑ "Monarch Airlines plans new routes in S17". routesonline. Retrieved 13 September 2016. ↑ "Thomas Cook Airlines UK - New route, new hotel: Birmingham to Sicily". Thomascookairlinesuk-newsroom.condor.com. 2016-07-13. Retrieved 2016-10-02. 1 2 "01JUL16 Update – Thomas Cook UK New S17 Short-Haul Routes". Routesonline. Retrieved 2016-10-02. ↑ "Thomson - Holidays designed for you. Only from Thomson". Thomson Holidays. ↑ Number of Passengers including domestic, international and transit. 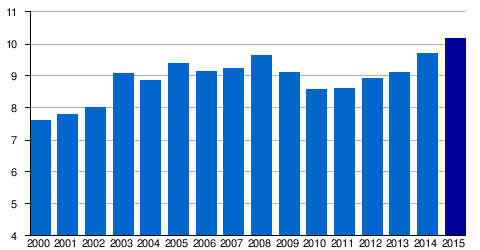 ↑ Number of Movements represents total takeoffs and landings during that year. ↑ Harro Ranter. "ASN Aircraft incident 19-JAN-1973 Vickers 813 Viscount G-AZLR". Retrieved 4 June 2015. ↑ "AAIB Report on N90AG accident"
↑ "Report on the serious incident to Airbus A310-304, registration F-OJHI, on approach to Birmingham International Airport on 23 February 2006". UK AAIB. Retrieved 28 December 2007. ↑ "AAIB Report on OO=TND incident"
↑ Harro Ranter (15 June 2006). "ASN Aircraft accident Boeing 737-301F OO-TND East Midlands Airport (EMA)". Retrieved 4 June 2015. ↑ "BBC News article, 27 July 2006 – Cargo plane crash pilots sacked"
↑ "Cargo flight 'a near catastrophe'". BBC News Online. 29 April 2008. Retrieved 29 April 2008. ↑ "Accident description". Retrieved 24 June 2016. ↑ "Birmingham airport plane crash: Liver transplant operation goes ahead successfully – Top Stories – News – Birmingham Mail". Retrieved 20 November 2010. ↑ "Airport at centre of security row". Birmingham Mail. 4 June 2007. ↑ "AIRPORT SECURITY WHO WOULD RATHER READ SLEEP THAN X-RAY BAGS". The Express. ↑ "Airport security lapses exposed". BBC News. 4 June 2007. ↑ "Arson attack on police helicopter". BBC News. 8 June 2009. Retrieved 22 May 2010. ↑ "west midlands police ready to take off with new chopper". Birmingham Mail. July 2010. ↑ "Man accused of Birmingham Airport security breach". BBC News. ↑ "Birmingham International Station". Birmingham Airport. ↑ "High Speed Rail Command Paper" (PDF). DfT. ↑ "Network West Midlands". Route 97. ↑ "Coach or Bus". Birmingham Airport. ↑ One Black Bear. "Cash Fares - Single Journeys". Retrieved 4 June 2015. ↑ "recommended cycle routes". Birmingham Airport. ↑ "By Bike". Birmingham Airport.